” I told Bruce Arians, ‘Let’s send him.’ All the receivers were supposed to do 15-yard stop routes. I said, ‘Let’s just chuck it deep. If they pick it, it’s a pick way down there, and it’s just as good as a punt. Ed Reed lined up to the left.” — Ben, on the “third-and-19 rainbow pass” to Antonio Brown, from Peter King’s column this morning at SI.com. There’s a reason why the Steelers have been so good for so long. The system gets the coaches the players, the players get coached, and the players fit into the roles the old Steelers like Jack Lambert and Terry Bradshaw and Mike Webster defined; and before you know it, James Harrison (three sacks against Baltimore), Roethlisberger (two touchdowns, 101.8 rating, seventh straight win over the hated Ravens) and Maurkice Pouncey (a brute force in the middle of the line, though a rookie) take their place, and play big in big games the way their predecessors did. You can read all of Mr. King’s column here. “It’s Ben. You give this guy an opportunity to snap it; he’s capable of producing plays. It’s not always how you draw it up, but he has a no-blink mentality. He is a competitor and a winner. And those guys follow him.” — Coach Tomlin, post-game. There is not much that separates the Pittsburgh Steelers and Baltimore Ravens. Both teams have elite defenses, Pro Bowl players, future Hall of Famers and two of the best coaching staffs in the NFL. But on Pittsburgh’s sideline you have quarterback Ben Roethlisberger. And on Baltimore’s sideline you have Joe Flacco. Game, set and match in favor of the Steelers. The game marked Roethlisberger’s seventh consecutive win over Baltimore — Pittsburgh’s biggest rival — and improved his career record to 9-2 against the Ravens. It’s painfully obvious that the Ravens will not climb “Mt. Roethlisberger” until Flacco closes ground on Pittsburgh’s two-time Super Bowl winning quarterback. You can read the rest of Mr. Walker’s column here. “He may not be Brady or all those other guys, but when I see him in the huddle I know we’ve got a chance to win,. He’s a proven winner. And history shows he’s a proven winner against Baltimore.” — Hines Ward on his quarterback, post-game. They would not let Ben Roethlisberger go into the windblown night. The game was won and an icy rain swirled in the stadium lights. And still nobody left. 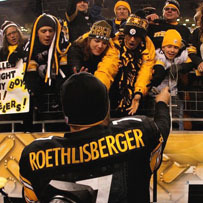 The roar of 64,879 turned into an embrace wrapping itself around the Steelers quarterback, holding him as close as a field and walls would allow. It was less than six months ago that he stood nervously in the gymnasium at St. Vincent’s College in nearby Latrobe, terrified at what awaited him from the gantlet of fans lined up on the first day of training camp. But they did cheer him anyway that day, just as they stood and waved and clapped on Saturday as he tried to finish an interview with the CBS announcers. A technician grumbled that the noise was too loud for the audio to be heard. Nobody cared. A fan held a sign that read: “No. 7 lead us to No. 7,” an allusion to the six Super Bowls the Steelers have already won. Roethlisberger must have seen it behind the television camera. He nodded that way. When the announcers were done with him and he pulled off the headset, he walked toward the locker room. He was alone, only a line of photographers in front of him. A great roar spilled down around. He smiled some more. He waved to the fans on the other side of the field and they waved back. You can read the rest of Mr. Carpenter’s column here. “I told you early in the week, Hines Ward and Ben Roethlisberger know how to win playoff games. We didn’t put them away, so we had nobody but ourselves to blame.” — Ravens linebacker Terrell Suggs, post-game. The play that came in from the sideline called for the outside receivers to run 15-yard “stop” routes, but Ben Roethlisberger didn’t like the math. He knew it was third-and-19, and that 15 yards wouldn’t do it. So in the huddle, with 2:07 left in a playoff game that was tied 24-24, the Steelers’ quarterback changed the call. Roethlisberger looked at those outside receivers, Mike Wallace and Antonio Brown, and told them to run “go” routes — as far as they could, as fast as they could. You can read more from Mr. Graziano here. “It’s not just me, by any means. All I have to do is throw it.” — Ben, post-game. – That of quarterbacks with at least 10 post-season starts, only Bart Starr (9-1) has a higher winning percentage than Ben (9-2)? – That Ben now has as many playoff wins as Peyton Manning (9-10)? Ben, Hines Ward and James Harrison were interviewed earlier in the week by their former head coach Bill Cowher. The interviews were shown yesterday during the CBS pre-game show.